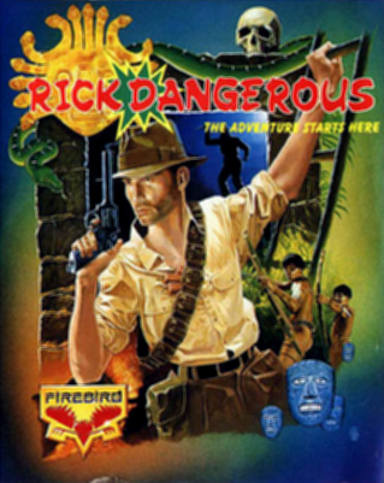 Rick Dangerous is a series of two platform games released by Core Design (who would later make Tomb Raider) in the 1980s. Rick can jump and climb, and carry a limited amount of dynamite and ammunition for his gun. The gun is Rick's main means of disposing of enemies, although most traps that can kill Rick can also kill his enemies if used correctly. The dynamite sticks are generally used for puzzle solving, such as by blowing up certain blocks. (Of course, some of them fly towards the explosion, potentially killing Rick in the backfire). Rick is also armed with a pogo stick that allows him to paralyze enemies with split-second timing. Unusually, many of the traps in Rick Dangerous have no visible warning, which means that a player's initial progress through the game can be a nail-biting ordeal of trial and error. This was criticized by some reviewers. Rick returns to London after completing the last mission, and we learn that the city is under attack by aliens.